Leaking windows, ill-fitting doors, sluggish performance... for a car that was trashed by the press when it hit the road in 1981 the DeLorean has aged remarkably well. Its creator may have died but the car lives on. What's its lasting appeal? Cars are the ultimate lifestyle purchase. What you drive speaks volumes about who you are. The new Mini - jolly singleton; Ford Focus - parent; anything with moulded spoilers - wideboy. 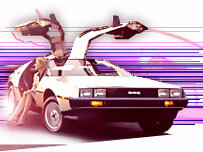 So what about the DeLorean DMC-12, one of history's most talked-about cars, although not always for the right reasons? "To drive one, it helps to have an ego the size of a house," says Chris Parnham, reflecting on the two DeLoreans in his garage. Such is the celebrity of the DeLorean that a simple excursion to the local filling station can turn into a major outing, he says. "You get mobbed. When you draw up at a junction everyone wants to let you out first so they can tuck behind you and see what it is. Absolutely nothing on the road gets the attention the DeLorean gets. You see people's jaws drop." Costing a relatively modest £18,000 to £20,000 for a well-maintained model - a fraction of the price of other head-turners such as a classic Ferrari or Lamborghini - the DeLorean, it seems, is a car for show offs on a budget. The death, at the weekend, of John DeLorean, the controversial American tycoon, will do nothing to detract from the buzz about the cars that bear his name. The saga of how this maverick industrialist took £85m of government cash to set up a production plant in Northern Ireland in the late 1970s, only for the whole thing to collapse amid recriminations and reports of lost millions, is one of those rare things: a truly thrilling tale about politics and industry. But while the DeLorean production line ground to a halt in 1982 as John DeLorean himself was charged with cocaine smuggling - he was eventually acquitted - the car itself lives on in the hearts and garages of fanatics. 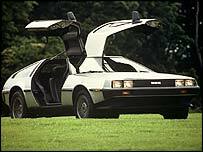 With its brushed stainless steel shell, gull-wing doors and low, wide profile, the DeLorean was an exotic creature. Targeted at the US market, it quickly won admirers. Talkshow host Johnny Carson, a DeLorean investor, was among the first to be seen pootling around LA in his DMC-12. The press, however, was less gushing. Early DeLoreans were damned for their leaking windows, erratic electrics and sluggishness. The fancy doors, meanwhile, had a tendency to jam, says Chris Parnham. The DeLorean was fast becoming a relic when it won a remarkable reprieve - a starring role as the time machine in 1985's Back to the Future, one of the biggest grossing films of the decade. Martin Gutkowski was a teenager when he saw the film. Now 28, and owner of two DeLoreans, he believes a recent resurgence of interest in the cars is down to others like him fulfilling their childhood dreams. "A lot of owners, like me, saw the film when they were young and now they've got the money they're living their dream." Originally an IT engineer, Martin's passion for DeLoreans has become a profession. He and a friend have set up a business in Southend, Essex, importing, restoring and selling on the cars to a British market. It's lucrative work. Of the 9,000 or so DeLoreans built in the early 1980s between half and two-thirds are thought to be still on the road, mostly in the US. 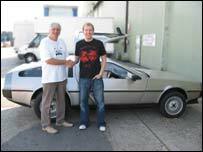 But Chris Parnham, secretary of the DeLorean owners club, says on average one a month is being imported back into the UK. The average age of club members is 28 - unusually young for classic cars, he says. Their love of the Back to the Future series also helps them bat off jibes about "flux capacitors" which are an occupational hazard for DeLorean owners. Like other DeLorean devotees, Chris would not be happy with just the one in his garage - he owns two DeLoreans, one of which is a Back to the Future replica, with all the additional pipework and jet-like exhausts. Its capacity for travelling back to 1955 high school proms is, however, so-far unproved. As well as the ego factor he admits the whole John DeLorean image - maverick, fast-living, dicey businessman - "only adds to it" when it comes to the car's appeal. 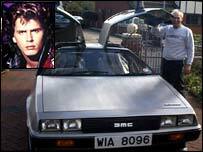 Owners, it seems, are happy to be associated with John DeLorean, warts and all. No-one though can hold a candle to Dave Howarth, 63, on the DeLorean glamour front. One of his three DMC-12s used to belong to Duran Duran bassist, and arch petrol-head, John Taylor. Dave does steady business in hiring his cars out for local PR stunts, especially if a company wants to convey a message about "the future". Safeway, for example, once borrowed one to announce its annual sales targets to employees, he says. "It's a pulling car," says Dave, perhaps shedding more light on its appeal to the twentysomething male market. But he sounds a note of caution to any Lothario intent on impressing the fillies with a spin in their silver dream machine. "The wife has only been in it twice in the 12 or 13 years since I've owned one, and it broke down both times."